The realm of the Hist is said to be a mysterious realm of Oblivion. It is a lush world, filled with sentient trees. Relatives of these trees include the Hist of Mundus and Clavicus Vile's realm. The Hist supposedly came to Tamriel from this realm in the Dawn Era. The realm is inhabited by Wisperills, colorful luminescent films that dance in the air. Tamrielic mythology states that, despite the Hists' neutrality, the realm of the Hist was mostly destroyed as the Ehlnofey war passed over it. A small corner of the realm survived and became Black Marsh, but the rest was sunk beneath the sea. This may imply that Black Marsh is a fragment of the realm, which was somehow sundered by the creation of Mundus. In the early Fourth Era, a large chunk of Clavicus Vile's realm was separated from the rest by Umbra. This bubble of Oblivion contained Umbriel, a floating island. Umbriel had its own population of Hist, as well as humanoids created by the second ingenium. In 4E 40, following Umbriel's invasion of Tamriel, a group of heroes infiltrated the island and successfully banished the island back to Oblivion by destroying the ingenium and killing Umbra. Among these heroes was Mere-Glim, an Argonian who was reborn within Umbriel, resulting in a connection with both the Hist of Umbriel and the Hist of Tamriel. When Umbriel was returned to Oblivion, the Hist there guided it to the realm of the Hist. Although it was no longer capable of flight, the island and the city on top were supported by the thick covering of trees and settled deep into the boggy ground. The lords and chefs of Umbriel turned to anarchy and tried to kill each other, but many of the skraws and fringe workers left Umbriel to make a living elsewhere in the realm. Mere-Glim and Fhena were among those who attempted to make a new life in the realm. A distant spire can be seen from the site of Umbriel, although it is unknown if it is an old building or simply a rock. 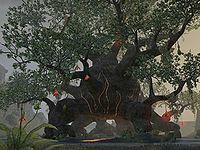 The Annotated Anuad seems to imply that the Hist originate from one of the twelve shattered "worlds of Creation" formed from Padomay's anger, which were then coalesced by Anu to create Nirn.